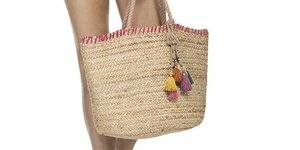 Perfect for taking to the beach or for a walk, the Agua Bendita Cobra Sarah Bag has plenty of room for everything you'll need. The backpace in animal and floral print has wide shoulder straps and an adjustable drawstring. The Agua Bendita Cobra Sarah Bag in animal and floral print features wide shoulder straps with adjustable drawstring in a backpack style.